Research shows that 95% of people only look at the first page of search results. And half the clicks on that page go to the first three results. That means if you get keyword use wrong, you’ll seriously hurt your business. That’s because you’ll miss out on the benefits of getting organic traffic when people click through to your site from a list of search results. And no organic traffic means fewer leads and sales. No business can afford that, right? In this guide, we’re going to show you how to use keywords for SEO the RIGHT way so you get the traffic, leads and sales you need. Before we go any further, let’s make sure we’re on the same page about keywords and SEO. 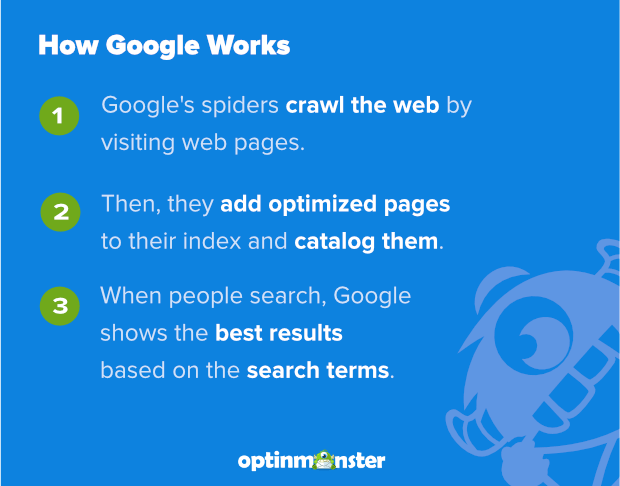 SEO is optimizing your web pages for better ranking in search results pages (SERPs). Part of the SEO process is using keywords: words and phrases that describe what your content is about. Then Google uses that information to determine which content is relevant to a particular search query, and how the page should rank in searches for a particular term. That’s what gives a web page its search ranking. Next, let’s look at how you get started when using keywords for SEO. An important starting point when using keywords for SEO is doing keyword research. That’s how you find the right keywords to include on a web page in the first place. As we said earlier, use of keywords helps Google assign the right search ranking. Keyword research also helps you come up with your content strategy by creating content around the terms that you know your audience is looking for. The best practice is to focus each piece of content on a different keyword phrase, and never use the same keyword more than once. That’s because you don’t want to end up competing with your own content for search rankings. In the next section, we’ll look at how you find SEO keywords to use in your content. First, brainstorm the terms that you think your potential customers might be searching for. Next, find related terms by searching on Google, scrolling down to the bottom of the page of search results and seeing what else people searching for that term also looked for. And finally, discover the keywords that people are already using to discover your site by using Google Analytics and Google Search Console. We describe the process in detail in our keyword research 101 article. Keyword research isn’t just useful for creating new content. It’s also an important part of improving SEO for existing content. Two useful tools for for this purpose are Google Analytics and SEMrush. We’re going to show you how to use these in the next two sections. 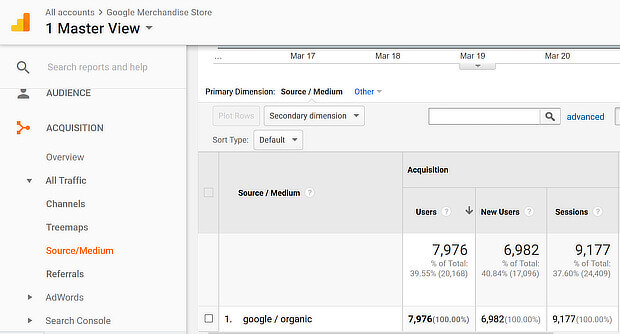 Google Analytics will help you find the pages on your site that are already popular with visitors, and are getting organic traffic. These’ll likely only need a bit of tweaking to make the content perform even better. To find the pages, go to Acquisition » All Traffic » Source/Medium. Click on google/organic. You’ll see your content in a table, ranked by the number of users in the past week. Then add Landing Page as a secondary dimension, to see the list sorted by landing page. Make a note of your top pages in an external file, or simply export the results. 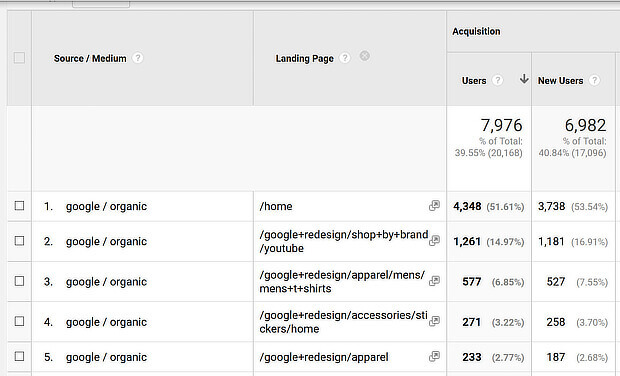 Google Analytics isn’t your only option for finding pages where you can optimize SEO keywords. You can also use SEMrush. To do this, log into the site and go to SEO Toolkit » Organic Research » Positions. Type in your domain name. 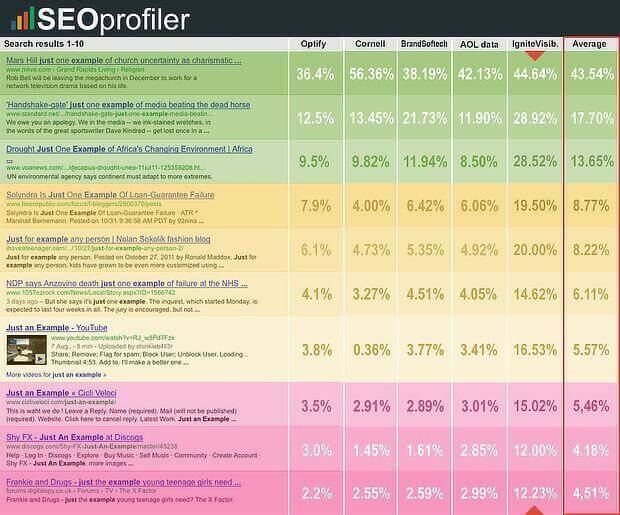 This will show you the keywords your site is already ranking for, along with their position in SERPs. Pay close attention to the keywords where your content is ranked between 4 and 10. These are good candidates for optimization to bring you closer to a top 3 ranking for those keywords more quickly. 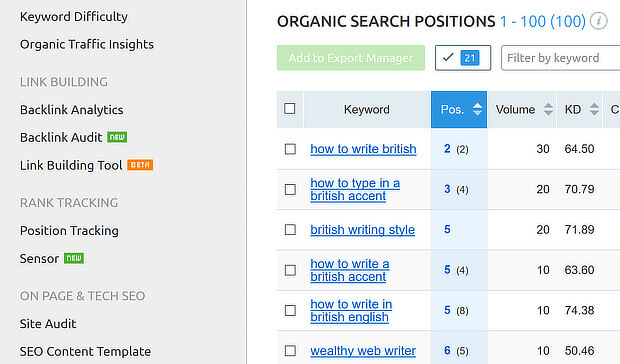 SEMrush has another tool that can help you with content optimization using keywords on your website. 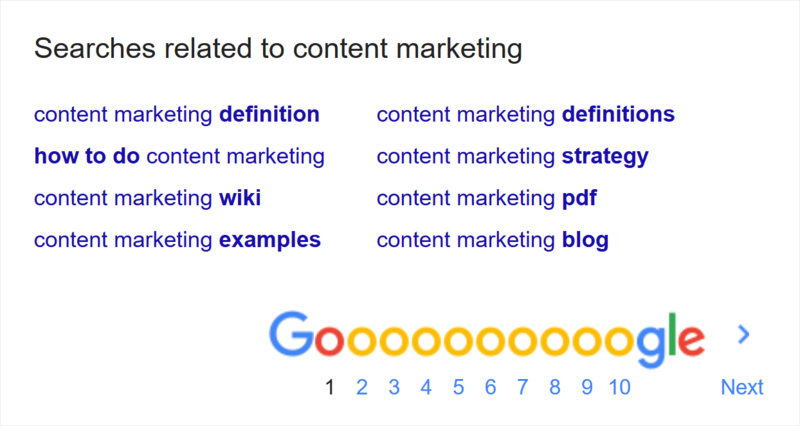 To use it, go to the Content Marketing Toolkit and select SEO Content Template. Type in your keywords and the tool will analyze Google’s top 10 results, and will make recommendations about keywords to include when you optimize the content. That’ll give you a headstart in improving your search ranking. Once you have that information, the next step is to edit your content. So, where exactly should you be using keywords for SEO? We’re going to explain exactly where, why and how in the next section. Here are the key places where it makes sense to use keywords for SEO. To make the process of adding keywords easier, we suggest you use one of these top SEO software plugins or apps. Optimizing page titles is part of technical SEO, and is a good starting point when using keywords for SEO. 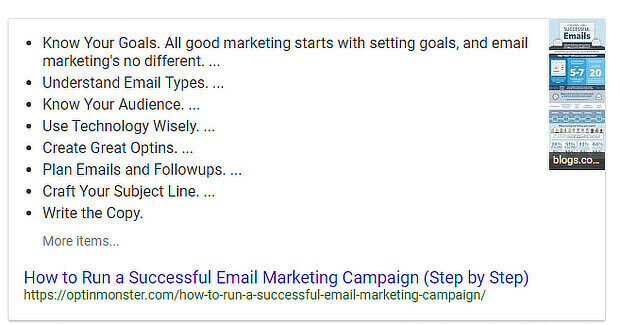 A page title describes the main subject of your page and shows up as the first line of a search results entry to let both Google and searchers know exactly what the page is about. In many cases, the page title may be the same as the headline for a blog post or the name of the page (like “about” or “services”), but it doesn’t have to be. You can use SEO software like Yoast SEO to tweak the SEO title to improve search ranking potential. The best practice when writing page titles is to use your target SEO keywords or keyword phrase at the start of the page title. That’ll make sure that it’s seen as more relevant. Also, more practically, your page title won’t get cut off in mobile SERPs, which can happen on small screens. Learn more about assessing page titles in our SEO audit guide. The next important area for the use of keywords for SEO is the meta description. This shows up as the second part of a search results entry. Though the meta description is no longer a direct ranking factor, it can help Google determine how relevant your content is to what people are searching for. The meta description also helps searchers decide whether to click through from a search result to see the full content on your website. That’s why it’s so important to use the right keywords here. By right, we mean relevant to the content that searchers will find when they click through. Before we get into how to use keywords for SEO within the main content, let’s talk about subheadings. Subheadings help make your content scannable, giving readers’ eyes somewhere to pause. Subheadings may help visitors decide about the relevance of content to their needs. They may also appear as part of a featured snippet or answer box. Learn more about this type of structured data in our SEO audit guide. The best practice is to use keywords in at least a couple of subheadings. One of the most important places to optimize use of SEO keywords in is in your content. That’s because content is one of the top SEO ranking factors. But it’s essential to get it right; poor keyword usage can actually hurt your search ranking. For example, it’s crucial to avoid keyword stuffing. If you’ve got keywords in every other sentence the chances are your content will incur Google penalties. Google has an excellent example of the kind of thing to avoid. Your readers won’t like it much, either, as keyword stuffed content can be pretty hard to read. First, use your main keyword in the first couple of sentences of your content, or at least within the first paragraph. Next, use that keyword and variations of it, throughout the content, as shown below. The best practice is to include latent semantic indexing (LSI) keywords rather than the exact keyword every time. These might include some of the phrases that showed up in the SEMrush SEO content template we talked about earlier. The bottom line: write for humans first, and make content readable and understandable. When you’re considering how to use keywords in a website, images probably aren’t the first items you think of, but you can’t afford to ignore them. Here are a couple of reasons why. First of all, images are indexed too, creating another way that people find your content. Second, images can help you handle content accessibility, which is useful for the millions of searchers worldwide who experience a disability. So, how and where should you use keywords for SEO in images? First, make sure any images you use are relevant to your content. Next, give them a file name that reflects that relevance. You can include keywords or LSI keywords here if it makes sense. Use SEO keywords in image titles, which are little pieces of text that pop up when you hover your mouse over an image. Finally, use SEO keywords in alt text. This is the part that helps with accessibility. The best practice for using alt text with images is to make it descriptive; don’t just use the keyword. Here’s how you can add titles and alt text to images. Ever seen those URLs that are just strings of numbers and weird characters? Those can be a big turnoff for visitors. The best practice is to keep URLs short, and include no more than one or two keywords in a way that makes the URL make sense to people who are visiting. 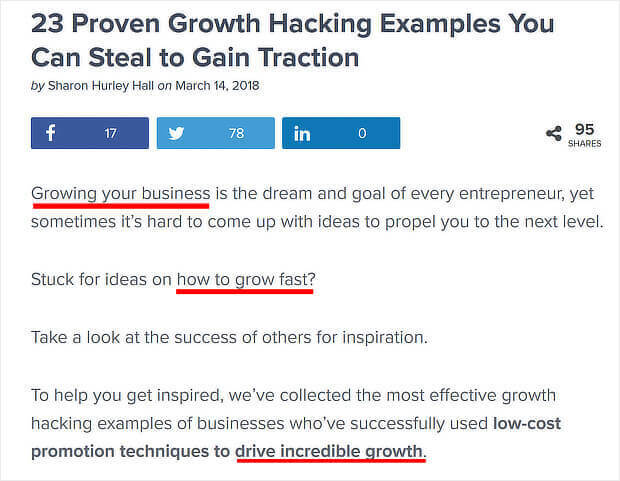 As before, avoid keyword stuffing, as in the example below from Moz. Links are one of the top three SEO ranking factors, so you absolutely have to optimize these for SEO. The golden rule is: vary your anchor text. That’s the clickable text that’s highlighted as a link. If you use the same anchor text for every inbound link you create, that’s an SEO ranking red flag for Google, and it might get you penalized. Instead, use LSI keywords to vary inbound anchor text. 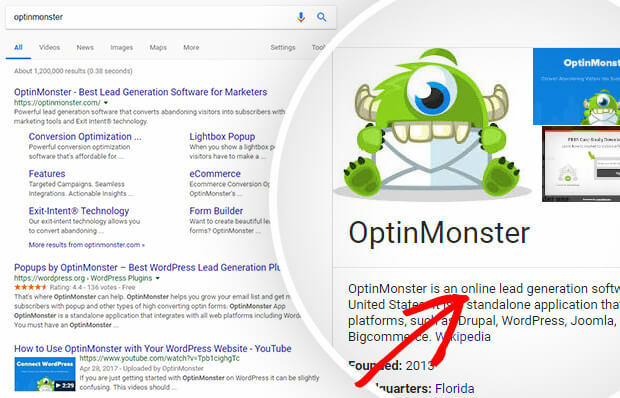 In the example below, the link points to content on the OptinMonster site with text describing our MonsterLinks™ key feature, rather than the actual feature name. The same rule applies to internal linking, which helps both Google and searchers find other site content. And it applies to external links, too. If too many links on your site use the same anchor text to link to another site, Google might think it’s a black hat SEO link scheme, and penalize your site, reducing its search ranking. Although social media isn’t a direct search ranking factor, research into social media and SEO shows that there’s a strong link between social shares and visibility in SERPs. That’s enough reason to optimize keyword usage in social media updates for better SEO. Moz recommends that you use keywords early in any social media update so that they’re immediately visible. 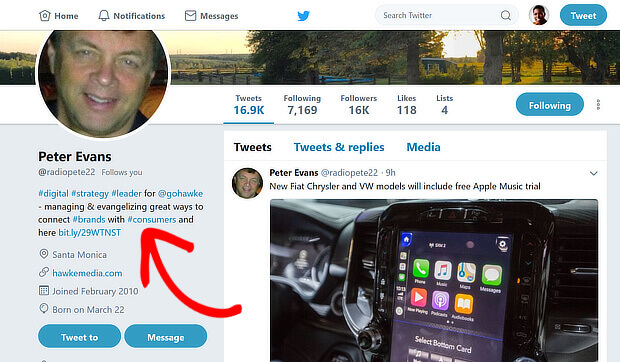 It’s also worth noting that Google indexes Twitter updates, so using keywords there can lead people to your Twitter profile, and from there to the content on your website. Keywords are also useful as hashtags in social media updates. This is especially true on Twitter, where using the right hashtags can make it easier for people to find content on the site. Other social media sites use hashtags, too, but pay attention to how you use keywords as hashtags, because hashtag use varies from site to site. You can also use keywords in your social profiles for branding. For example, if your business covers a particular niche, using a keyword is a quick way to signal this. Do this in your bio on Twitter and Instagram, and in the category and description for your Facebook page. Finally, external business listings can also be a great place to include keywords. For example, if you’re setting up a Google My Business listing, it makes sense to include SEO keywords in the business description. That’ll improve the chances that your business will show up when searchers type relevant keywords into the search box. And that’ll improve your online authority and click through rate. That’s it! Now that you know how to use keywords for SEO, check out our articles on using SEO for lead generation and the best keyword research tools to boost your content strategy. And follow us on Twitter and Facebook for more in-depth guides and useful tips. Sharon, that was a nice refresher article on the basics. I really enjoyed the rainbow graphic at the top, very clear way to demonstrate how traffic is divided according to rank. I will have to use that one. I enjoyed the SEMRush toolkit summary, but I felt the article woulda been even better with a section for Ahrefs users. The ‘Where to Use Keywords for SEO’ section was really helpful — specific, clear examples — just what I was looking for. Thanks so much for a great article! Exactly what I have been surfing for days on the internet, well detailed and clear article. I really enjoyed it especially the “where to use Keyword for SEO”. Great article, keep it up. Great guide Sharon! Thank you so much for sharing. I was wondering if off-page SEO is still worth it? Like using Personal Publishing Accounts or other social media where you can share your content. I’ve been trying for some months now to spread around content but still waiting for better results. I’ve read it needs diversity but I still haven’t figured it out yet. Very interesting post on where & how to use keywords in your content. Really appreciate the way you have written and explained Especially “How To Find Pages To Optimize With Google Analytics” Section.